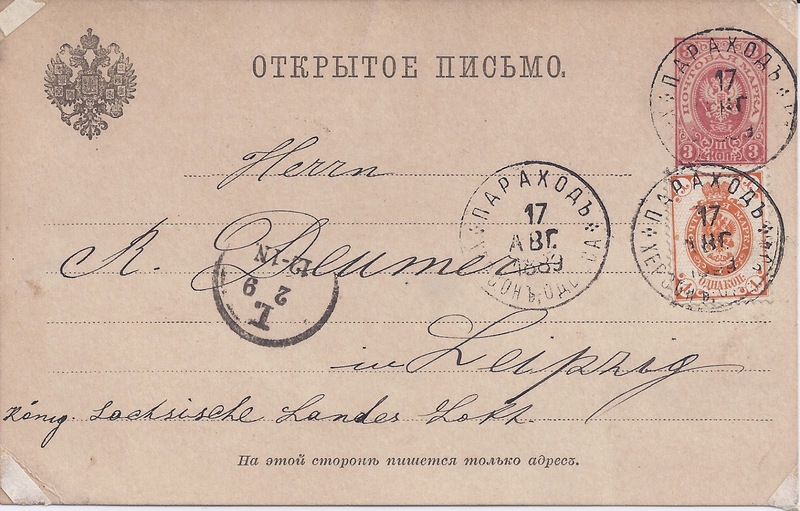 If you collect postmarks of Imperial Russia then you get used to working your way, quickly, through hundreds of covers and cards in dealer stocks and auction lots - every time you get the chance. You will probably assume that place name postmarks are round, TPO postmarks oval, and ship mail postmarks also oval. When I picked up the card below I headed for the place name at the top of the round place-name cancel and read PAROKHOD. That's a funny name for a place, I thought. Why would a place be called STEAMSHIP? And where is it? I looked to the bottom of the cancel and, moving between the three strikes, made out KHERSON. Oh, so it's in Kherson guberniya - and I looked for a GUB. to confirm it. Instead, I got ODESSA. At this point I had my Homer Simpson moment. Doh! Of course, how could I have been so stupid - it's a steamship cancel for the Kherson -Odessa line. Forget that I never even knew there was such a line. There clearly is and now I have to find out about it. Ninety-nine point something percent of swans are white, but there are also black swans. Ninety-nine point something of circular Imperial cancels are place name cancels but some are steamship cancels (as I did in fact know - Batum-Odessa being a common one).